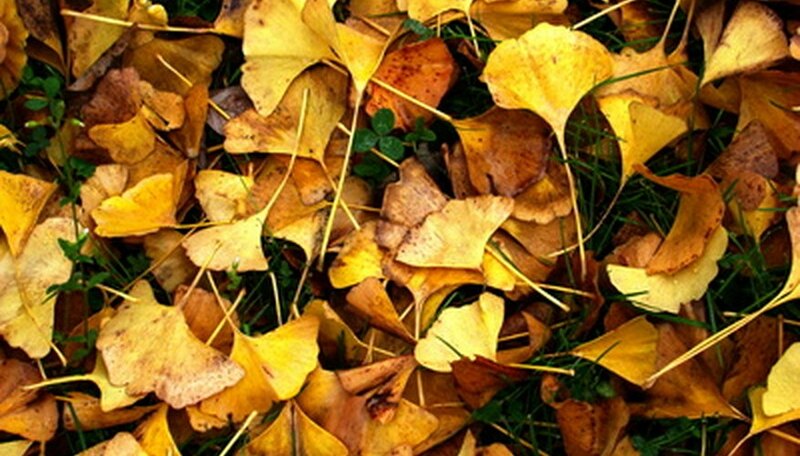 Pick out the most brilliant, vivid yellow tree leaves in the fall and more than likely you have spotted a gingko tree. Next to the sugar maple, the gingko is one of the most recognizable specimens in the fall landscape, not only because of its mass of lemon yellow leaves, but the fan shape of those leaves as well. Whether gingko trees are used in cityscapes, home landscaping or naturalizing a rural landscape, they are one of the most low maintenance, visually striking tree specimens of which growers may choose to employ. Pay attention to the surrounding area before you choose its home as the slow-growing ginkgo may eventually reach up to 40 feet wide and tower 80 feet tall. Be aware of overhead power lines, awnings and overhanging structures and other plantings that may eventually impede canopy progression. Plant your ginkgo in most any type soil without worry. This tree is not picky where it calls home as it is able to thrive under sun or partial shade in wet or dry, compacted clay soil as well as rich, friable soil with a wide range of pH from 3.7 to 8.0. Once the gingko is established, there is very little special care needed beyond basic growing methods. Allow the area around the base of the tree to remain free and clear of clutter around the base of the tree. The one thing ginkgo trees do not appreciate is having mulch or organic matter smothering its trunk where it emerges from the ground. When mulching, make sure the spread is not piled up but rather spread uniformly across the drip line. Refrain from pruning unless breakage or unusual crowding and bunching of limbs occur. The gingko is a species that forms an aesthetically pleasing shape on its own and will fill in its spaces to the proper density of foliage. Ignore the chemicals. Ginkgos are happy with no help from pesticides as they are resistant to insects and opportunistic pests. Fertilizer needs are fulfilled by a dose of a balanced timed-release fertilizer according to the fertilizer instructions pertaining to your individual size tree.